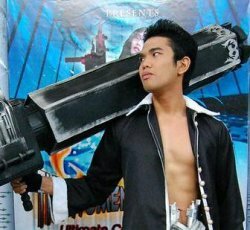 For someone who’s big, tall and oozing with manliness, perpetually optimistic cosplayer Steve Flores is seen almost always smiling and has a lot of good cheer to spread. Here’s an interview that shows that even the toughest man alive can be a softie on the inside. 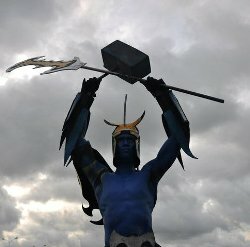 Asgard: Everyone cosplayer has their story of how they got into cosplaying, tell us yours. A: What character did you cosplay for the first time and why did you pick that? S: At the time, I was so engrossed with old 80’s action and sci-fi movies and hearing about the cosplay I decided to cosplay Arnold Schwarzenegger’s most famous character, The Terminator. And to think my first cosplay costume was purely borrowed from jacket to the shotgun! A: But we’re pretty sure you saved a lot of money then. How many characters have you cosplayed to date? S: Hmm, not a lot. I cant remember but I think I did 10. A: Which of those characters cost you an arm and a leg? S: That would have to be Sven from Defense of the Ancients (DotA). Not really an arm and a leg was lost but it really cut into my lunch money. A: How did you put your sven costume together? Is that your personal favorite? S: Oh yes, cuz for me it was cool to portray a guy who can throw thunder hammers at people to stun them and having insurmountable God’s strength to cut them down. Haha! Putting the armor together was fun because I got to learn from my best friend Xag on the basics of cosplay armor making. He taught me how to cut and assemble and I did the work all by myself which was very self-rewarding indeed. A: You seem to have an affinity for characters who wield lightning. tell me, is it part of your cosplay plan to go as Thor? S: Thunder and lightning’s great and all, but my category is Gar cosplay. Gar is an internet term for characters that appear more manly and stronger that you can ever be. 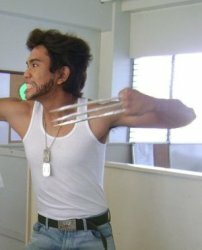 I like cosplaying characters that have the muscle and heroism to safe the pretty lady from danger. A: So how would you react if we say you should do Jorgen von Strangle from Nickelodeon’s The Fairly Odd Parents? S: Im actually planning on cosplaying him for a friend on her birthday! A: Complete with the fairy wings and the wand? S: Already planning on drawing the blueprints for the wand next month! A: What other characters are on your cosplay plans list? S: The sky’s the limit for me. There’s Duke Nukem, Collossus from the X-men, The Punisher… Maybe the Hulk when I get really buff and ripped? We’ll never know! A: So what does Steve Flores do when he’s bored? S: Hang out with Friends of course. And if I got the time, I hit the gym, or play sports or videogames, or just goof around with my bestfriend Xag. A: What was the greatest cosplay achievement you ever made? S: . 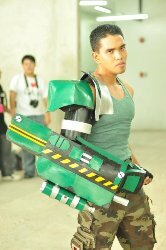 I guess its gotta be the Davao MACCDO event at SM where I won best cosplay. I got an award and a free gundam figma! Not only that, I got to make the judges laugh at my comedy act the next day on stage on their Cosplay got talent where the president of the group that made that event offered me a free trip to Davao to perform my skit and cosplay there at one of their events. A: You paved the way for over a hundred cosplayers on the Xavier University Festival Days 2011. How did you manage that herculean task and how did you end up with the job of overlooking the whole event? S: I could not have made that event possible without the help of my team. Although there were only 5 of us who planned and made the 3 day event, it was also the hundred plus cosplayers who attended which made it a success and made it the most memorable cosplay events here in Cagayan de Oro City. And I had to do it; as the head and main representative of the event, I had to make sure everything ran smoothly. I must admit there were flaws in the whole shabang, but all-in-all, it was done and everyone had fun and enjoyed themselves. It was an event to remember. A: Have you done both armored and non-armored cosplay? S: Yep. I’m getting interested with non-armored cosplay because the costumes are really nice and they make me look decent and presentable. But then again, nothing beats body armor to make you think you’re invincible. A: Is there an anime character that you can relate to the most? S: Ah, of course! Sanosuke Sagara from Rurouni Kenshin. I got my alias from his last name! A: And why is that so? S: Cuz he takes no crap from anyone and fights for his beliefs no matter what. A: What advice would you give to newbie cosplayers? S: Dont be afraid; Stand strong. Cosplay with all your heart, and of course, make friends and have fun. Also, dont be afraid to approach fellow cosplayers, you’re one of us, that means we’re family. A: What’s your favorite anime of all time? S: Actually, I have a lot of favorite anime titles to choose from, but I choose Rurouni Kenshin because it reminds me of a special girl who first introduced me to anime way back. If It wasnt for her, I would have never been where I am now. A: For a manly man, was there a specific anime that made you cry? S: Actually there were three anime titles that made me bawl like a baby: True Tears, Lovely Complex and Angel Beats. A: Really? Why? And what’s your stand on a real man cries? S: Let’s put it this way, A man holds back emotions and acts tough, while a real man admits his vulnerability and expresses it without fear of ridicule or shame. Crying doesn’t mean you’re weak, crying shows you’re human.